In recent posts, we’ve taken the opportunity to provide our patients and loyal readers with some practical tips when it comes to personal dental care. Topics have included, “Foods That Make Your Teeth Stronger,” “How To Care For Your Teeth When You Have Braces,” and even “Common Myths About Orthodontic Treatment.” We do hope you get the chance to peruse these posts at your convenience, as they will give you a good starting point in reference to having braces and having excellent oral health in general! Today’s post, by contrast, is going to shift gears a bit. We’d like to let our current and past patients do a bit of free marketing for us, as we highlight some of our favorite reviews and testimonials that we’ve received over the past months. 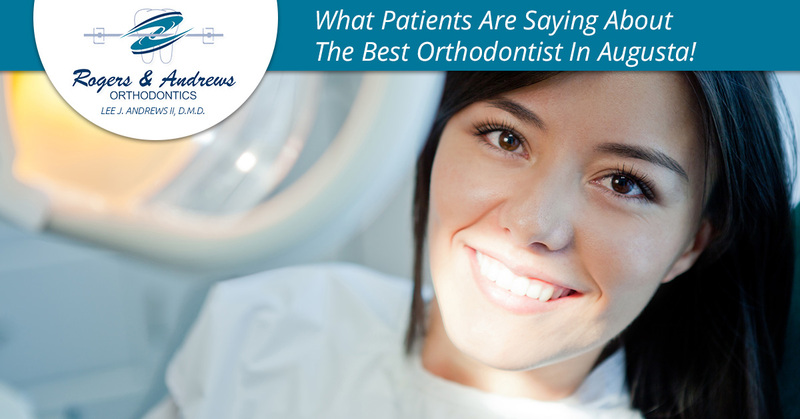 And while we will certainly take any chance we can get to highlight positive patient experiences here at Rogers & Andrews Orthodontics, the main purpose of this blog post is to inform those of our readers who are looking for the best orthodontist in Augusta that they can have a wonderful experience at our clinic in Augusta. Whether you are interested in teeth straightening, adult braces, or a children’s orthodontist, we hope you find these reviews illuminating as you search for the right local orthodontist for you and yours. Karin, thank you for taking the time to let us know how your experience was at Rogers & Andrews Orthodontics. We are thrilled to read your kind words! We understand that getting braces as an adult is not always the most pleasant thing to experience, but to hear that we made the process easier on you and that you were actually looking forward to the last few months of your treatment — puts smiles on our faces. Thanks again, Karin! B., thank you for your business and very sweet words. We wanted to highlight this review in particular because it speaks to our dedication to respecting the busy schedules of our patients. Whether it’s adult or child orthodontia, we recognize that people take time off of work to come see us in the middle of the day. We want to perform quality orthodontic treatment while ensuring that we don’t take up half of your day in the process! Thanks again for letting us know how we are doing, B. We are so thrilled that you felt welcomed and comfortable when walking through our doors, KWill. We appreciate your business, five stars, and glowing recommendation as well! We wanted to highlight the fact that KWill brings up an excellent point regarding our online paperwork. For any future first-time patient reading this piece, check out our patient forms right here! We look forward to our future together as well — thanks again, KWill. Bobbie, thanks for your straightforward and much-appreciated five-star review. We are thrilled you found Dr. Andrews and our staff friendly and the office clean. At the end of the day, we want to be a place where both adults and children feel at ease. That way, we can get to straightening those teeth so you can achieve your absolute best smile! Thanks again, Bobbie, and please come see us again in the future. If you’ve been looking for a reliable and local orthodontist that you can trust, we hope the above reviews make the point fairly clear. That being said, we understand that there is much more that goes into the decision-making process than hearing about the experiences of folks who were once in the same shoes you are wearing (looking for an orthodontist in Augusta, that is). Any questions you might have we will be able to answer over the phone or in person, but we also have a wealth of helpful resources available for browsing at your convenience. Whether you are wondering what orthodontists do in the first place or you have concerns about getting braces, visit our orthodontic treatment FAQ resource for detailed answers to frequently asked questions! Ultimately, we want you to be comfortable with your orthodontist and your treatment plan. We take patient service quite seriously here at Rogers & Andrews Orthodontics, which is why we make it a point that everyone has a great time when they come see us! Whether you are looking for treatment for your child or yourself, give us a call. Contact us today!